Miso Crafty Knits: Hey June! It's mid-June already, and I'm in complete denial about it. Probably because I'm not prepared for school to be out for summer holidays in a week. And while I should technically be scrambling around trying to get stuff done around here that I otherwise can't really do while the Kiddo is at home, I'm doing what any (in)sane procrastinator would do - I take naps. I do laundry (which, in all honesty, really needs to be done. So maybe that's a win?). I pretend I'm in a movie montage when a cheesy 80s song comes on the radio...which is quite often since I tend to listen to the 80s channel. A lot. ➳ Stash Dash update: I've got nothing. At the start of Stash Dash my hands started to act up and so I had to give them an extra long break. But this past week I've been slowing getting back to it and miraculously managed to knit up and finish the body of my Islay cardigan. All That needs to be done are the sleeves and the I-cord BO around the fronts and neckline. Yay!! Double thumbs up!! At first I had huge doubts that I would be able to get this finished by the Islay KAL deadline (July 1st), but now I'm thinking it just might be do-able! ➳ Speaking of KALs, there's a few going on that I SO wish I could participate in but can't due to my crappy hands and limited knitting time. Caterpillargreen Yarns is hosting a Playground Shawl KAL that started yesterday (June 15th) and ends July 31st. I think the Playground Shawl is gorgeous and I just happen to have a skein of Concrete and Tulips in the shawl yardage put-up in the stash. 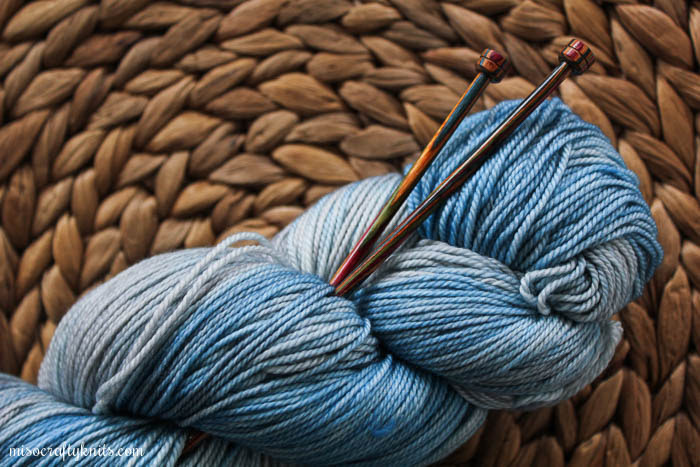 And then Tanis Fiber Arts is hosting the TFA Summer Blanket KAL that doesn't start until later this month and you have until the start of September to complete the blanket. I have a handful of blanket patterns in my queue that I would love to knit up, like the Missoni-inspired Chevron blanket, Fly Away, Pop, and Colorful Wedges, just to name a few. One day, one day I'll get around to knitting at least one of these up. ➳ Since we're on the subject of socks, I'm sitting on my hands and trying to convince myself that I do not need the newly released Hiya Hiya Sharp Sock Interchangeable needle set. I just don't. One, I already have several pairs of needles dedicated to sock knitting; and two, I rarely, if ever, knit socks in a needle size other than 2.25mm (US 1). But what a wonderful set!! ➳ I'm super excited for my friend, Chantel, her yarn, Mudpunch, will now be sold at Baaad Anna's in Vancouver! Congrats Chantel!! Even though I've been going "cold sheep" lately, I simply cannot resist the exclusive, dyed just for Baaad Anna's self-striping colourway (to see it, click on the Baad Anna's link above and scroll to the bottom). Since it was my birthday a few days ago, I think I'm going to use my birthday money to score myself a ball! ➳ You can't tell by the weather as of late, but as I mentioned earlier, summer "vacation" will be starting next week. For a while there I was freaking out about what to do with the Kiddo and how I was going to keep him busy all summer. But then I read this article and realized that I didn't need to plan out every single second of the Kiddo's day. I'm not going to use this article as an excuse or reason to do nothing all summer, nor do I really put too much into such articles, but when I thought about my own childhood summers...it all makes sense. My childhood boredom had spawned so many fun memories: from recording myself and my cousin reading Archie comics, to choreographing dances with my neighbours, to just riding my bike with friends anywhere we could think of...even if it meant biking 20 minutes to get an ice cream cone. So I'm ok with the Kiddo getting bored throughout the summer. It'll be interesting, in this digital day and age, to see what he comes up with to fill his time (sans electronics, that is. Cause you bet I'll be limiting that!). Your canning adventures sound amazing, and that is so great that you have made so much strawberry jam! The blueberry and lime sounds amazing, too- I hope you get to make it before the summer break kicks in. I'm taking Lila out of daycare at the end of June, and a little nervous about July and August with two kiddos at home! She starts kindergarten in the fall.